Director Adam Wingard and stars Nat Wolff, Margaret Qualley, and Lakeith Stanfield debuted the film at a "secret screening" in San Diego. As soon as the “Death Note” movie was announced, controversy came with it. The Netflix original film drew early ire for relocating the Japan-set story to the United States and casting a largely white group of actors in the main roles. Whitewashing claims have dogged the picture ever since, so it’s no surprise that director Adam Wingard was eager to show the film to fans. Reaction in the room was moderate, considering the setting. Cheers and applause greeted the cast and crew when they took the stage, and the film sparked intermittent laughter throughout. The ending, while rather abrupt, was met with sparse clapping that built into modest applause, giving the impression the crowd was nonplussed. Before the premiere, producer and former “Heroes” actor Masi Oka made sure to tell the crowd that creators Tsugumi Ohba, who wrote the original manga, and Takeshi Obata, who drew the illustrations, approved of the film. “Having the senseis be proud of the film, it made me proud and will hopefully make the fans proud, as well,” Oka said. Star Nat Wolff also noted how important the original “Death Note” was to the production, though he kept his statement open-ended enough to allow for changes. 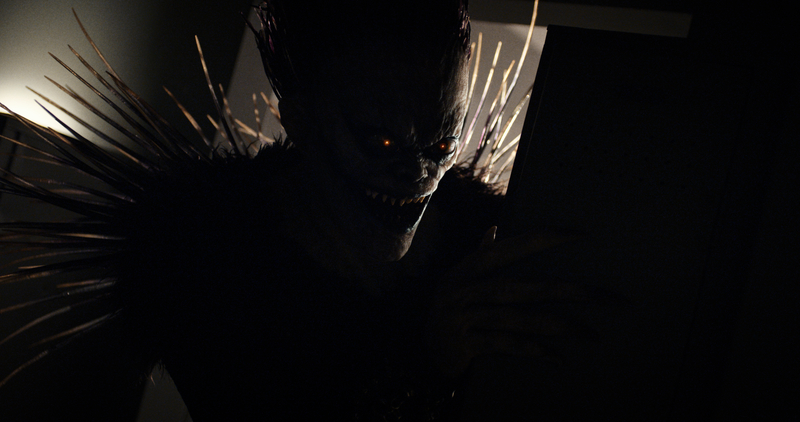 Earlier in the day, Wolff, Oka, Wingard, Margaret Qualley, Lakeith Stanfield, and producer Roy Lee took part in a Netflix panel that screened limited footage of “Death Note.” The only major talent not to appear was Willem Dafoe, who voices Ryuk, the supernatural spirit who distributes the murderous notebook. “The fact that there hasn’t been a satisfying Manga adaptation made in the U.S. is why we wanted to do it,” he said. “Can’t top that,” Oka said. Reviews of the film were embargoed out of the screening, but reporting that Willem Dafoe makes for a downright adorable angel of death was not expressly forbidden. “Death Note” premieres on Netflix August 25.